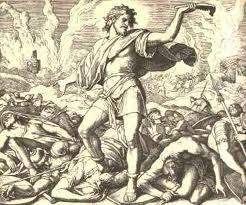 O Ewigkeit, du Donnerwort (O eternity, you word of thunder), BWV 20,[a] is a church cantata by Johann Sebastian Bach. He composed it in Leipzig for the first Sunday after Trinity Sunday and first performed it on 11 June 1724. 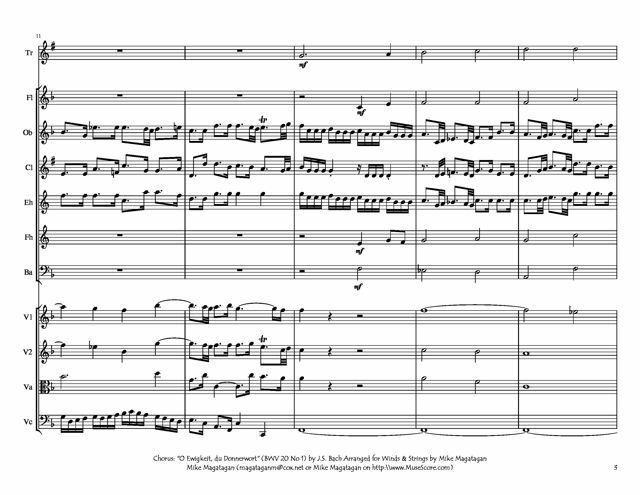 It is the first chorale cantata from his second annual cycle, of chorale cantatas, based on the hymn (1642) by Johann Rist on a melody by Johann Schop. Bach composed the cantata for the First Sunday after Trinity. The Sunday marks the beginning of the second half of the liturgical year, "in which core issues of faith and doctrine are explored". The year before, Bach had taken office as Thomaskantor in Leipzig. He was responsible for the education of the Thomanerchor, performances in the regular services in the Thomaskirche, the Nikolaikirche and others. He had started the project of composing one cantata for each Sunday and holiday of the liturgical year, termed by Christoph Wolff "an artistic undertaking on the largest scale". In 1724 he started a project on the first Sunday after Trinity to exclusively compose chorale cantatas, based on the main Lutheran hymn for the respective occasion, beginning with this cantata. Leipzig had a tradition of concentrating on the hymns. In 1690, the minister of the Thomaskirche, Johann Benedikt Carpzov, had announced that he would preach also on songs and that Johann Schelle, then the director of music, would play the song before the sermon. Bach composed some forty chorale cantatas in his second cycle. The opening chorus, beginning not only the cantata but also the second annual cantata cycle, is in the style of a solemn French Overture in the typical three sections slow – fast (vivace) – slow. The French Overture was designed to mark the entry of the king. The melody is sung by the soprano as a cantus firmus in long notes, doubled by the slide trumpet. The chorale is in bar form. The first Stollen of three lines is handled in the slow section, the second Stollen of lines 4 to 6 in the fast section, the Abgesang of lines 7 an 8 in the concluding slow section. The lower voices are mostly in homophony. 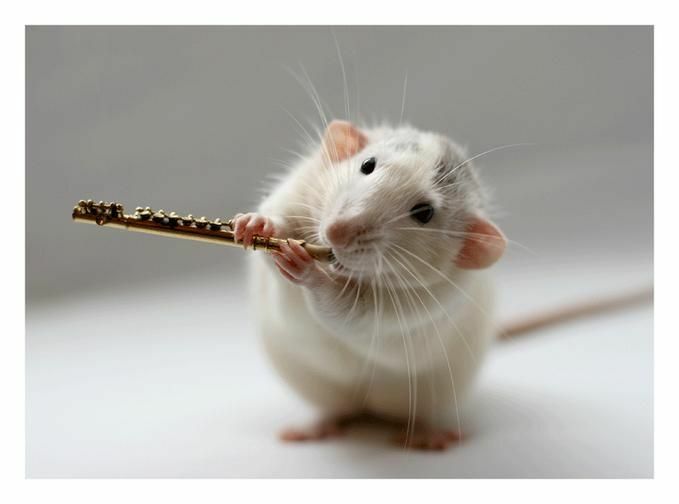 The development of themes happens in the orchestra. The rising theme of the slow section in dotted rhythm is derived from the beginning of the chorale tune, whereas the theme of the fast section is not related to the tune. The fast section is not a strict fugue. Bach seems mostly interested in illustrating the text, Ewigkeit (eternity) is rendered in long notes in the lower voices and the instruments, Donnerwort (thunderous word) appears as a sudden change to short notes with a melisma in the bass, on the words große Traurigkeit (great sadness) a downward chromatic line, a counterpoint in the fast section, also appears in the voices, erschrocken (terrified) is rendered in jarred rhythms interrupted by rests, first in the orchestra, then also in the voices, klebt (cleave) is a long note in the voices. John Eliot Gardiner describes: "The fragmentation and disjointed nature of the discourse is uncompromising and leaves no room for hope", and summarizes regarding the cantata: "Confronted by the baffling and disquieting subject of eternity, and specifically the eternity of hell, Bach is fired up as never before". The recitatives are mostly secco, with an arioso only in movement 9 on the words Pracht, Hoffart, Reichtum, Ehr, und Geld (splendor, pride, riches, honor, and wealth) from the chorale. The arias contrast, interpreting the text in its affekt and in single phrases. In movement 8, the call to wake up is intensified by trumpet signals and fast scales, evoking the Last Judgement. 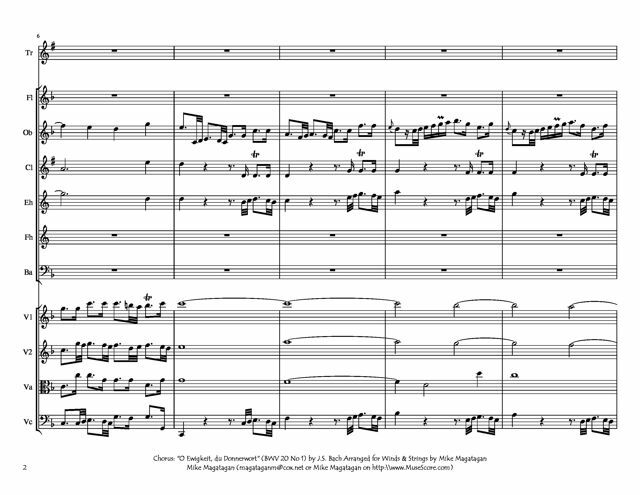 The first motif in movement 10 is sung by the two singers of the duet on the words O Menschenkind ("o child of man") and are repeated instrumentally as a hint of that warning. Both parts of the cantata are concluded by the same four-part chorale setting, asking finally Nimm du mich, wenn es dir gefällt, Herr Jesu, in dein Freudenzelt! (Take me, Jesus, if you will, into the felicity of your tent).. The cantata is festively scored for three vocal soloists (alto, tenor and bass), a four-part choir, tromba da tirarsi to double the cantus firmus, three oboes, two violins, viola, and continuo. The work contains eleven movements in two parts, to be performed before and after the sermon. 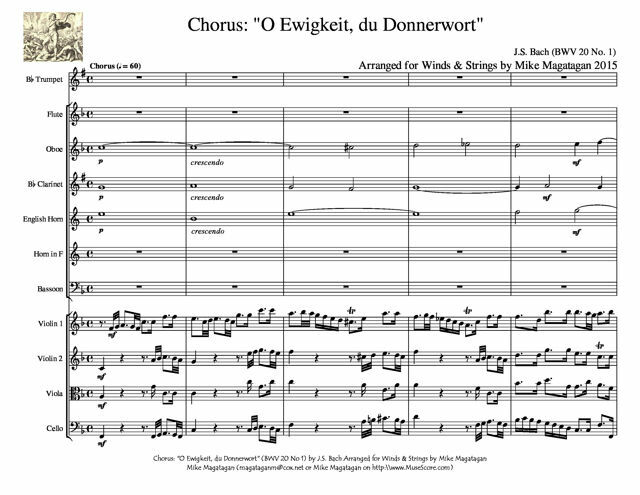 I created this arrangement of the opening Chorus: "O Ewigkeit, du Donnerwort" (O eternity, you word of thunder) for Winds (Bb Trumpet, Flute, Oboe, Bb Clarinet, English Horn, French Horn, Bassoon) & Strings (2 Violins, Viola & Cello).